Freesat launches £50 Manhattan HD-S2 HD box with iPlayer | What Hi-Fi? 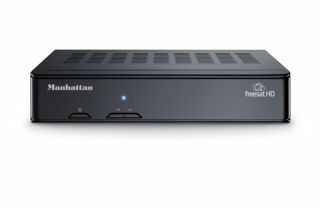 Freesat has announced the launch of a new compact HD box for the free-to-air market, the Manhattan HD-S2. The new Freesat HD box will retail at the low, low price of £49. Offering users 150 free TV and radio channels, six channels will be available via HD as well as support for on-demand TV services such as BBC iPlayer and ITV player by connecting the HD box to the internet. It's a cheap way to add HD TV and catch-up content to any TV (provided you can access Freesat), though not quite as cheap as the Now TV Box. Other features of the new set top box include an eight day on-screen programme guide for improved planning purposes and the ability to generate eight favourite lists – enough for family members to create personalised viewing preferences. Parental control, interactive TV/digital text and audio description functionality come as standard. Matthew Huntington, Chief Technology Officer at Freesat, says: "This new box extends the scope of HD viewing to viewers wanting to choose a really excellent value option or those looking to add Freesat HD to a second or third room in their home." The Manhattan HD-S2 Freesat HD box is available to buy at retailers inlcuding John Lewis and PC World/Currys from today.